SoundTaxi M4V converter lets you take absolute control of your iTunes videos Play your movies, TV shows and music videos without DRM restrictions Supports high quality HD videos for conversion Get your free copy of SoundTaxi today! SoundTaxi is a powerful and user-friendly tool to convert M4V files into popular video formats like AVI, MP4 and WMV. With the help of SoundTaxi M4V converter, you will be able to convert any type of videos into desired format and resolution. Conversion runs effortlessly and virtually in no time. If you used to purchase or rent movies and TV shows from Apple iTunes Store, then using SoundTaxi M4V iTunes converter is truly a right decision. Do not waste a minute - download your SoundTaxi free copy or select your SoundTaxi edition. SoundTaxi lets you playback any media and use your video favorites freely with no limitations on any device you like. This software combines clear and handy interface with high performance capabilities in order to convert iTunes video into unprotected formats. Apple iTunes Online Store offers a wide selection of videos of any kinds for purchase and rent. You will find full-length movies, TV shows and music videos to fit any taste. These videos are delivered in M4V format, which is compatible with Apple devices but is not supported by a majority of digital video players and software applications. In addition, iTunes M4V files are DRM-protected, which means that the strict playback and sharing limitations are imposed on their use. That is why if you would like to use iTunes movies freely and play them back on any device you like, you will need a working M4V video converter. SoundTaxi is definitely the right software to choose as it converts any sort of iTunes videos to any format you like including iTunes video rentals. Even if you purchased or rented a movie or a TV show from the store - SoundTaxi does M4V conversion effortlessly, just like it converts any other video formats. 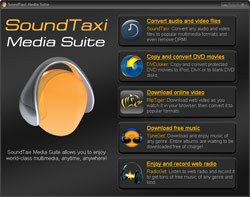 SoundTaxi M4V converter provides you with best results with minimum time and effort expenditure. It supports all popular video formats, and will be able to convert M4V to AVI, WMV, MP4, and lots of other formats. This M4V iTunes converter will bypass iTunes DRM protection and let you watch output files on any device you want with no restrictions. SoundTaxi is extremely easy to use - all you need to do to convert M4V files is to choose a video you want to convert, select a desired output format and hit "Convert" button. After that the software will start converting your video with the highest possible speed and perfect quality. So if you need a reliable, fast, and easy to use M4V video converter, download and try SoundTaxi to enjoy your iTunes videos without any restrictions just the way you always wanted to. Looking for the easiest iTunes to MP3 converter? - click here to give it a try.